What is a vegetarian diet? How do vegetarian and other diets impact our health, environment, and cultural identity? Use our resources to get some ideas. The BBC article and the AsapSCIENCE video speculate what might happen if the world went vegetarian. What is a vegetarian diet? Do a quick scan of our resource on diet for some help. Vegetarian describes a diet that does not include meat, fish, or poultry. People choose to be vegetarian for many reasons, including personal health, religion, concern for animal welfare, or concern about the environment. What might be some benefits of a global vegetarian diet for human health and welfare? What might be some costs of a global vegetarian diet for human health and welfare? The world’s poor would lose their most calorie-rich food. What might be some benefits of a global vegetarian diet for biodiversity? Farmland for crops generally requires far fewer acres than farmland used for ranching and livestock. Some tracts of land may revert to natural ecosystems, providing increased habitat and migration corridors for endemic and migrating species. What might be some costs of a global vegetarian diet for biodiversity? Converted livestock farmland may result in increased urban and suburban sprawl. 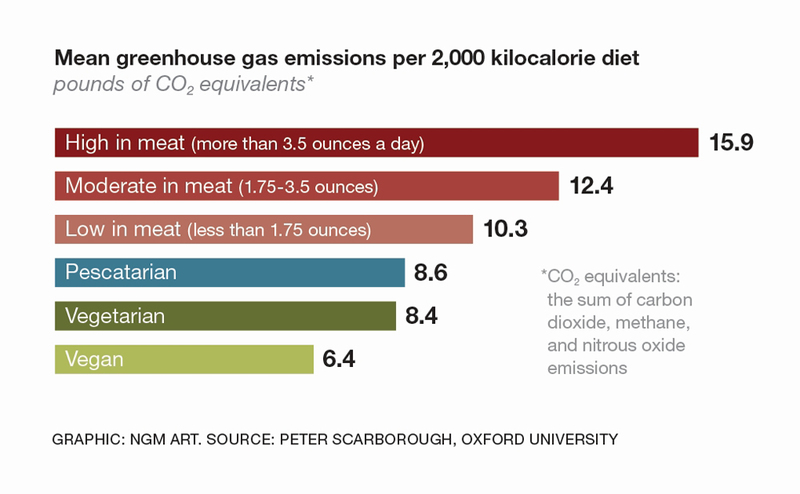 Vegetarian diets would shrink greenhouse gas emissions. What might be some environmental benefits to global vegetarian diet? Greenhouse gas emissions would drop by a third. Agriculture contributes more to climate change than industrial emissions. Our “water footprint” would shrink. Freshwater currently used for ranching might be directed toward consumption and hygiene. What might be some environmental costs to global vegetarian diet? Many agricultural regions are not natural “farmlands” and have nutrient-poor soil. When parts of the Sahel were converted from ranchland to cropland, the result was desertification. Converting former ranchland to forest or grassland would require significant amounts of time, money, and effort. “It’s not this either-or, vegetarian-or-carnivore scenario,” says one expert. How can we modify our diets to best balance the costs and benefits of a vegetarian diet? Eat less. Smaller portion sizes reduce our foodie footprint. Reduce prices of fruits and vegetables. Reduce your food waste—fewer than 50% of the calories currently produced are actually used effectively. BBC Future: What would happen if the world suddenly went vegetarian?